TOLEDO — Bowling Green’s first outdoor hockey game received rave reviews. 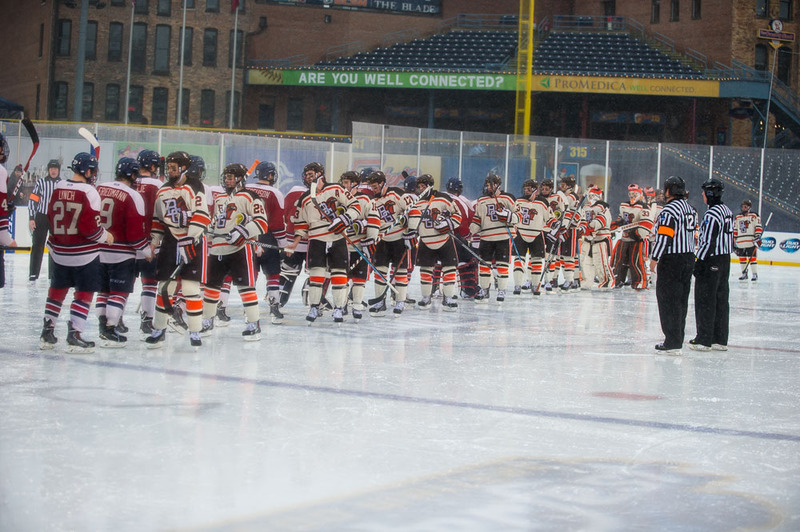 The Falcons and Robert Morris handled adverse conditions, playing an entertaining game en route to a 2-2 tie before a crowd of 3,806 at Fifth Third Field. The game was played in a heavy rain with a light wind and temperatures in the upper 30s when the opening puck dropped at noon. Fifth Third Field is the home of the Class AAA affiliate of the Detroit Tigers. The game was part of the Winterfest, a 10-day celebration of winter. Winterfest was the idea of the Toledo Walleye, an East Coast Hockey League franchise. The stadium has a capacity of just over 11,000 for hockey. The Falcons entered the game ranked 13th nationally, while RMU was 19th. BG is 11-3-3 overall and RMU is 12-3-4. Despite the rain, there were no puddles on ice that was approximately 4½ inches deep. The hockey rink was built across the outfield. The only major problem with the ice were pebbles that formed when the rain drops hit the ice and instantly froze. The ice was set to 11 degrees. “The ice was just bumpy,” BG coach Chris Bergeron said. As a result, teams kept their games simple — firing the puck into the offensive zone and then going to forecheck. Fancy plays seldom worked. “By the second half, everyone got a feel for the rink, how the ice was going to be,” said Falcon goalie Chris Nell, who stopped 34 shots. The teams played a cautious first period, combining for just 13 shots on goal. But the teams had 49 shots over the final two periods and overtime. RMU finished with a 36-26 edge in shots on goal. Nell and Shafer said they had to be careful with every shot because of the bouncing pucks, and they had to be careful with their rebounds. Some fans braved the elements to sit in the stands. Others watched on the concourse level where they stayed dry under the overhang from the upper deck of the stadium. The suites were full. Fans had to battle freezing rain in the area during their travels to the game. “This is something our student-athletes are going to remember for the rest of their lives,” said Schooley, who was a defenseman at Western Michigan from 1990-94. He’s in his 11th season at RMU. “They may never get a chance to do this again,” Schooley added. “They were excited to play. You deal with the elements. This is an outdoor game and we knew there’d be elements. We just thought there would be snow and not a torrential downpour. It was fun. The biggest challenge for the players was staying warm in their wet uniforms and equipment. The equipment managers from both teams will have a short turnaround to make sure the equipment is dry for Sunday night’s series finale at 7 in RMU’s 84 Lumber Arena. The Falcons traveled to Pittsburgh immediately after Saturday’s game. The weather was more of a nuisance than anything else. “It was nothing we couldn’t handle,” said Pohlkamp, who is from Baxter, Minn., where they have outdoor ice rinks and heating centers. The players on both teams also had a good time during their practice at Fifth Third Field Friday afternoon. Players and coaches took selfies. The BG coaches had their kids on the ice. “That was really cool,” Pohlkamp said of the practice. Schooley joked the only person complaining about Saturday’s weather condition was him. He changed his clothes after the second period, saying his clothes felt five pounds heavier because of the rain. The RMU coaches wore their warmups, while the BG coaches wore Falcon letter jackets.